Grammy nominated Hip-Hop Jazz artist and Mashpee Wampanoag Tribal Member, The ZYG 808 Delivered the keynote speech and performed for the Massachusetts Department of Transportation's Native American Heritage Luncheon. A large room full of MassDOT employees and members of the general public gathered for the Native American Heritage Month Luncheon and Presentation at the DOT building in Downtown Boston, last Monday, November 19, 2018. This years keynote speaker: 15 year-old, Grammy nominated hip-hop jazz, The ZYG 808. 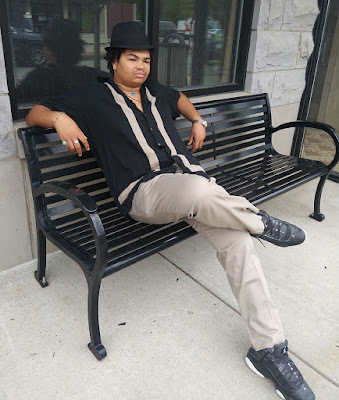 An active member of the Mashpee Wampanoag Tribe's Youth Council, as well as a sophomore on the honor roll at Mashpee Middle High School, the young musician came to share his thoughts on sovereignty as well as perform some of the Grammy nominated songs from his debut EP "At The Party". Within his presentation he addressed the Land Into Trust Issue faced by his tribe after the current administration chose to reverse the tribe's status as a sovereign tribe. A curiosity with words, language and the oral tradition is something that my family has maintained in various forms for many generations. The word "Sovereignty" -According to the Oxford Dictionary- means, "…supreme power or authority; or the authority of a state to govern itself..." Free will is a form of sovereignty, where you have the freedom to make choices of both actions and words. My traditional name is Ahanamasq, which translates to "Laughing Bear". Having a traditional name is a type of sovereignty; considering that we had names forced upon us by he colonists and subsequent governments. · Are you ready, able and willing to accept responsibility for and the consequences of your actions? · Are willing to verse yourself and your leadership in the ways of good governance? · Are you ready, able and willing to address the needs and concerns of the people you govern and those affected by your actions with temperance and equity? The Mashpee Wampanoag are a sovereign people, and for some of us that sense of sovereignty pre-dates being granted Federal Recognition by the US government. It's a sense that is reflected when we maintain and practice our social traditions. · Our sovereignty is present in the work of my elders Gail Hendricks-Hill, Carla Riley, Marl Perry, Vonnie Brown, my father, and Joan Avant who provide a solid and culturally enriching education for upcoming generations. · We remain sovereign because elders like John "Jim" Peters, and Hartman Deetz lead by example on the front lines in standing up for our rights. · We are sovereign because of the efforts of Robert Peters, Annawon Weeden, and Russell Peters Jr, in preserving and teaching younger generations how to build our traditional dwellings. · Our sovereignty lives in the work of Martin "Bruzzy" Hendricks, Chiefy Mills, Brian Weeden, Keon Jackson, the Wakeby Lake Drum, the Native Suns Drum, and Crystal Maddox in seeing that our traditional songs and dances are passed on to upcoming generations. However, there remain some people who labor to keep tribes and nations like the Mashpee Wampanoag socially, politically and economically disenfranchised. These are the same people who maintain and re-introduce the Anti-Native sentiments of Andrew Jackson and Abraham Lincoln. These are the same people who feel it is better to jeopardize the water supply of the people of Standing Rock with a leaky oil pipe line then run the pipeline through a golf course; or feel it's okay to build time share condos on ancient, unmarked burial grounds. As a sovereign people, these are some of the issues and obstacles that we face. Thankfully there are so many people within our tribe like the ones I mentioned earlier who influence and help prepare the tribal members of my generation to function as a sovereign people whether the US Govt. Agrees or not. It should stand to reason that economic and educational self-sufficiency are among the things that any sovereign people strive for. If it is truly your intention to honor native people, I ask all of you sitting here to call your Congress-people and strongly encourage them to support the "HR - 5244 Mashpee Wampanoag Tribe Reservation Reaffirmation Act". This is your opportunity to Stand with Mashpee.